Review Nothing quite says Autumn like the arrival of a fresh crop of Linux distros. Well, for Linux fans anyway. As usual, both Fedora and Ubuntu are gearing up for new releases, with the Ubuntu crew already pushing out the first betas of Ubuntu 9.10, dubbed Karmic Koala. Although Ubuntu 9.10 is only a beta release and still needs a bit of polish, there's plenty to love even in the testing release. Oddly though, the most notable thing in the latest release of Ubuntu 9.10 isn't actually in Ubuntu 9.10. Yes, we're talking about the Ubuntu One cloud storage tools. The Ubuntu One client software you'll find in the new beta is designed to give you a simple way to backup, sync, and share files over the web. Ubuntu One offers 2GB of storage for free, with a 50GB option available for $10/month. 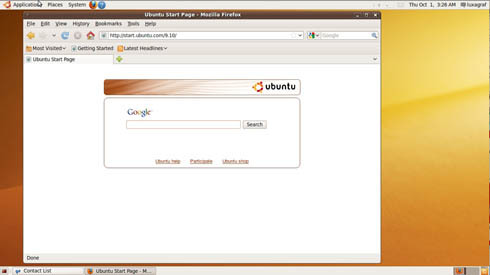 Ubuntu One also offers public shared folders which other Ubuntu users can access from their PC (anyone not using Ubuntu can still access the files through their browser). Similar in both price and usage to other cloud backup and sync solutions (like Dropbox), Ubuntu One lets you designate which files and folders you'd like to backup or sync between Ubuntu installs. Previously, using Ubuntu One required enabling the universal repositories and installing the client software. The other noticeable thing in Karmic Koala is the performance boost, particularly when it comes to booting up your PC. Earlier this year, Canonical announced plans to optimize boot performance, the goal being to get the system up and running much faster. You won't find it in Karmic Koala, but the eventual goal is to deliver 10-second startups by the time Ubuntu 10.04 is released in 2010. Once I got the 9.10 beta installed on my trusty Toshiba, I grabbed a stopwatch (okay, an iPhone stopwatch) and hit the power button. After restarting about a dozen times I found that the average startup time was 26 seconds, with the Xorg starting around the 15 second mark. That's only one second off Ubuntu's goal for Karmic Koala and a significant improvement over previous releases. Still, it's a little disappointing given that the eventual goal is ten seconds. But keep in mind that the Toshiba test laptop is five years old and sports a mere 512MB of RAM. Newer hardware should see much better performance. If you want to really see Karmic Koala fly, try installing it on a solid state drive. Although I haven't tested it, there are plenty of reports around the web showing Ubuntu booting on an SSD in less than 10 seconds. Next page: But who needs to boot?